B ack in 1986, a culinary miracle occurred. Dalvinder Multani, an Indian immigrant who had spent the past four years making pizzas in New York City, purchased an aging pizzeria located on what was then a rough corner of San Francisco. Called Zante’s, it was named for a small Greek island. Though Multani has aspirations of opening an Indian restaurant, he decided to also continue to make pizzas in the space, selling pies by the slice, a nod to his time in NYC. Customers could order containers of verdant saag paneer and crispy samosas alongside slices of perfectly greasy pepperoni pizza. The more imaginative of clientele kept asking Multani to combine his two offerings -- North Indian food and pizza -- into one flavor-packed dish, and he obliged. The first iterations of Indian pizza emerged into the world and went straight into the stomachs of hungry diners. There were two options initially: "Best Indian Veggie Pizza," made with a mix of eggplant, cauliflower ginger, garlic, and spinach and “Best Indian Meat Pizza,” crafted from a mix of tandoori chicken, lamb, spinach, and cilantro. Zante’s has since expanded its Indian pizza offerings to include toppings like chicken tikka masala and daal makhani, a creamy lentil dish. Zante’s pies, topped with both popular Indian dishes and melty cheese, were an instant hit and continue to be popular today among the Bay Area crowd. “Zante’s is an institution,” proclaims Oakland-based chef Preeti Mistry. “I lived in the Mission in my early 20s and had Zante’s pizza many, many times,” she says with a laugh. While Zante’s is arguably the most famous of the restaurants serving Indian pizzas, it’s not the only one. “There is a long history of Indian pizza being served in major cities like New York and London,” adds Mistry. One such restaurant is Curry On Crust, which bills itself as a “desi pizzeria.” Co-owner Dipali Patel says the team opened the restaurant in Canton, Michigan, located just outside of Detroit, in 2012. The menu features over 30 pizza options separated into categories like Paneer, Chicken, and Veggie. (“Being Hindu, we didn't want to serve pork and beef in our facility,” says Patel, explaining the topping selection at the restaurant.) 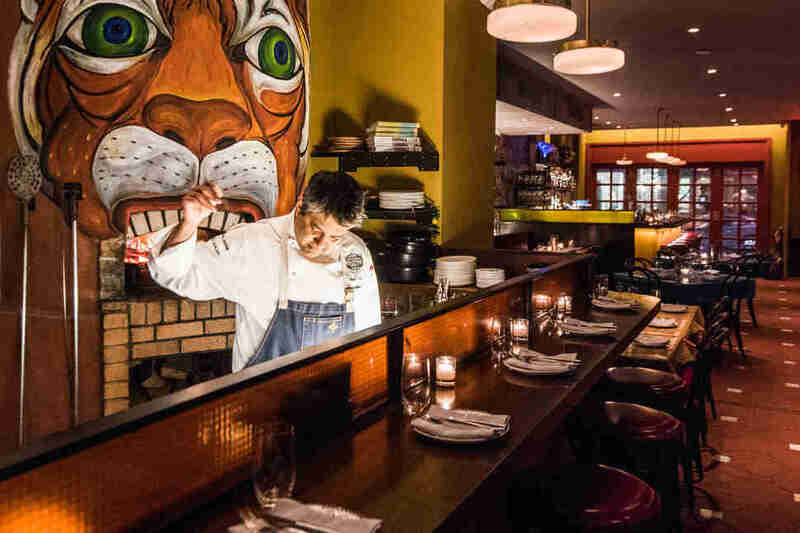 Patel, who also owns Neehee’s, one of Thrillist’s best Indian restaurants in the country, says that the top selling pizzas are the butter chicken pie and the aloo gobi (potato and cauliflower) pie. To do this, she enlisted a baker to help create the optimal chewy thin-crust pizza, one that she brushes with house-made ghee before dropping the pies off to a table. As for toppings, sure there was a chicken curry pie, but it wasn't made with the standard spiced-and-diced chicken pieces. Mistry instead braised the poultry and pulled the meat so that the topping remained velvety. She also drew inspiration from childhood dishes, sautéing vegetables like julienned carrots and snap pieces with curry leaves, mustard seeds, turmeric, and chili powder before adding it to a pie or saucing a crust with creations like a fenugreek pesto. 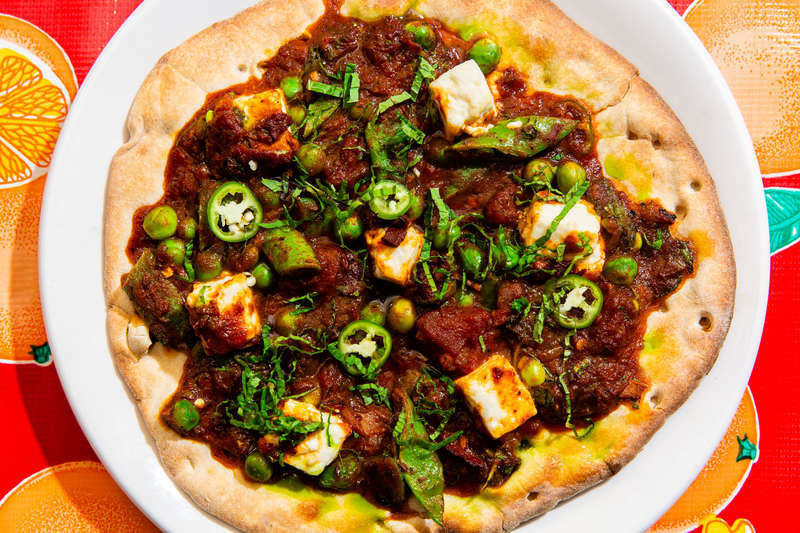 New York City-based chef Floyd Cardoz is also playing with people’s expectations of standard Indian dishes by reimagining them as pizzas at his SoHo restaurant Bombay Bread Bar. The restaurant came with a built-in pizza oven, making it a natural addition to the menu. While most Indian pizzas tend to come on a standard pizza crust, Cardoz instead turns to a range of Indian flatbreads for a base. Like Mistry, Cardoz places a giant emphasis on the quality and sourcing of his ingredients, making the corn dough base from Anson Mills cornmeal, mustard seeds, mustard oil, and garlic. The crust is cooked in the tandoor oven before being topped with mustard greens that have been cooked in a ginger and tomato base. And instead of a heavy sprinkle of mozzarella cheese, Cardoz opts to layer on swirls of goat cheese before baking the pie off in the oven. 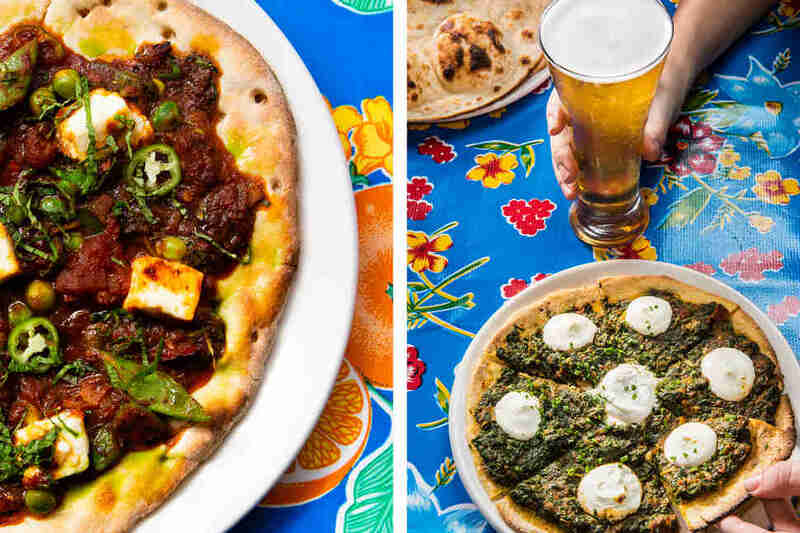 He is now riffing on a naan pizza at brunch topped with bacon, Cheddar, and fried eggs and he reveals that he also working on a mattar paneer pizza, which reconstructs the popular pea and fresh cheese dish as a pie. While at first glance, Indian pizza might not seem like a category that works -- the ingredients are from two very different cuisines -- it’s actually a combination that makes a lot of sense, says Cardoz: “Both pizza and Indian food are based on bread.” Patel agrees, adding that she thinks people are sick of the usual toppings are looking for things that are more “flavorful.” For Mistry, the draw of Indian pizza is the how creative it allows her to be. In many ways, it’s opening up a whole category of flavors that the mainstream has yet to explore on their pizzas. So is Indian pizza set to take over the country? 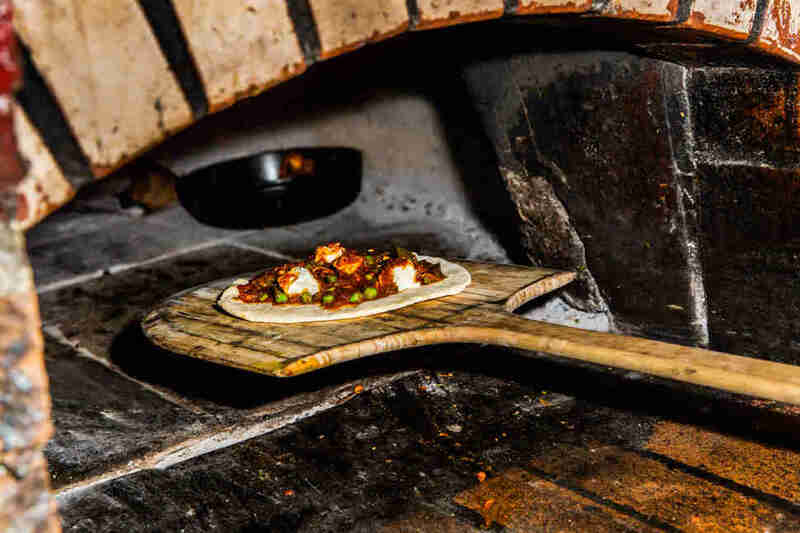 Will Domino's and Pizza Hut soon be slinging paneer tikka masala pies? Maybe. The chains do make things like tandoor chicken pizzas in other countries, so America might not be that far off. Khushbu Shah is a senior food editor at Thrillist and could live on chili paneer pizzas for the rest of her life. Follow her pizza eating @khushandoj.